June 10, 2012, Day 218: A week after last Sundayʻs visit from Senator Will Espero, longtime Kauaʻi activist Nani Rogers dropped by (De)Occupy Honolulu to share song, history, and advice. 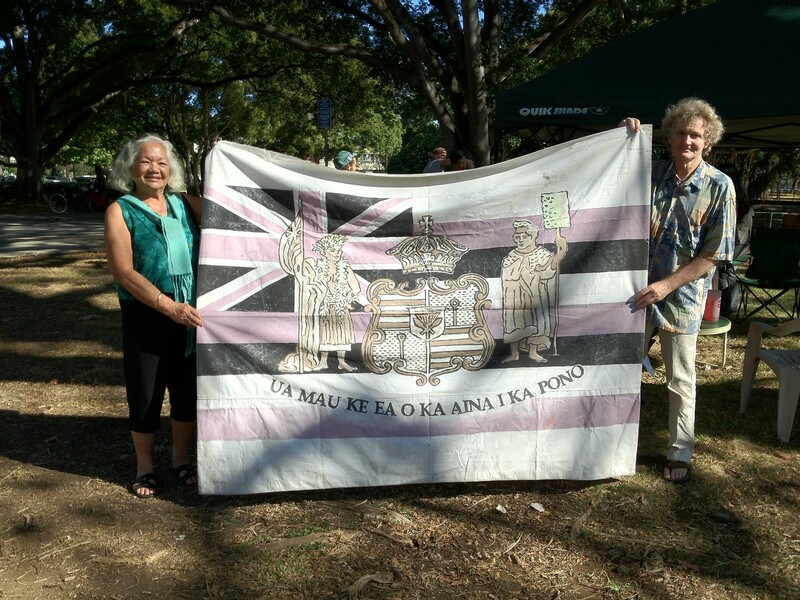 She was on hand to welcome the return of Michael Daleyʻs painting/banner, "Ua Mau Ke Ea O Ka Aina I Ka Pono," which was one of three paintings targeted by the City for seizure on 4/30/2012. But unlike the political Q&A session with Senator Espero, this gathering took the form of the usual Food Not Bombs jam session. Or I guess I should use the term kanikapila in this case. Click here for a 12 photo Flickr set with more pix from yesterdayʻs music canopy at (De)Occupy. (De)Occupy Honolulu is in solidarity with Occupy Wall Street and the worldwide Occupy Movement which asserts that a democratic government derives its just power from the people, but corporations do not seek consent to extract wealth from the people and the Earth; and that no true democracy is attainable when the process is determined by economic power. We urge people to exercise the right to peaceably assemble, occupy public space, create a process to address the problems we face, and generate solutions accessible to everyone. At 219 days, it is the most enduring encampment in the worldwide Occupy Movement.